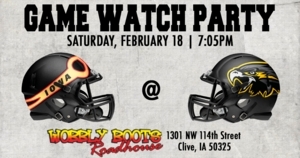 Cheer on the Iowa Barnstormers at Wobbly Boots this Saturday, February 18! Enjoy great food and enter to win prizes! The Barnstormers are traveling to Wichita Falls, Texas to take on the Nighthawks. Kickoff is set for 7:05pm CST.